This image released by HBO shows Kit Harington, left, and Emilia Clarke on the season finale of "Game of Thrones." 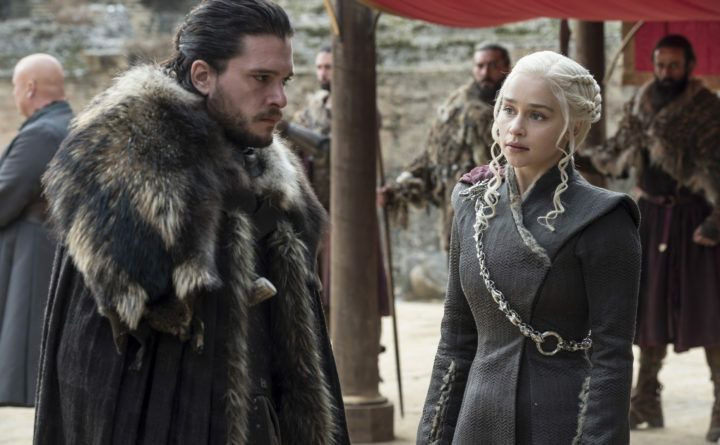 The eighth and last season of "Game of Thrones" returns Sunday, April 14, 2019. For those of you who are not fans of “Game of Thrones,” you can stop reading this article now. For those who are, however, you know what happens this weekend: the premiere of season eight of “Game of Thrones,” set for 9 p.m. Sunday night on HBO. After nearly two years of waiting, over the next six weeks we’ll finally find out what happens to all our beloved — and not-so-beloved — characters. How will you be getting ready for the big night? Here’s a Maine-centric guide to celebrating the final rounds of the game of thrones. It will take you two days, 15 hours and 30 minutes to watch all seven seasons of “Game of Thrones” that have been released so far. If you took both Thursday and Friday off from work and devoted both those days plus Saturday and Sunday to watching all 67 episodes, you could still make it in time for the premiere on Sunday night. You’d have to watch for 17 full hours each day starting at 6 a.m. on Thursday, Friday and Saturday, and another 12 hours on Sunday, but you could do it, and still get six hours of sleep and 10-minute breaks between episodes. Then, you’d be fully up to speed in time for the season eight premiere. You’d also be exhausted. Or, you could just watch one of several really good full-series recaps available. One of the best ones out there is by Screen Junkies, which crammed all seven seasons into one epic 52-minute YouTube recap. Several national publications have also done extensive full-series recaps in print, including very good showings from both Vanity Fair and The New York Times. If you didn’t know already, there are some really cool local connections to the show. Maine company Glacier Wear out of Greenville outfits Night’s Watch and Wildling cast members with furs and pelts. Beau Chemin Farm in Waldoboro is tasked with preserving the rare Icelandic goat — the same species of goat that Daenerys’ dragon Drogon scarfs up while roving the Essos countryside. And don’t forget — the happily departed Littlefinger was played by Aidan Gillen, who starred in “Beneath the Harvest Sky,” which was shot in and around Van Buren! Check out his St. John Valley accent! There are several cool GoT events statewide leading up to the big day. On Thursday, Queen City Cinema Club in downtown Bangor will host an epic trivia night and costume party, set for 9 p.m. On Friday in Brewer, Generations Boutique on State Street will host a GoT-themed Paint and Sip and Trivia event, set for 5:30 p.m., and with a $35 fee. On Sunday, you can start the day in true Westeros style, with a GoT-themed brunch at Enoteca Athena in Brunswick, set for 10 a.m. to 2 p.m. and featuring such delights as House Tyrell’s Cheese and Onion Pie, Arya’s Oysters and Tyroshi Honey Fingers. 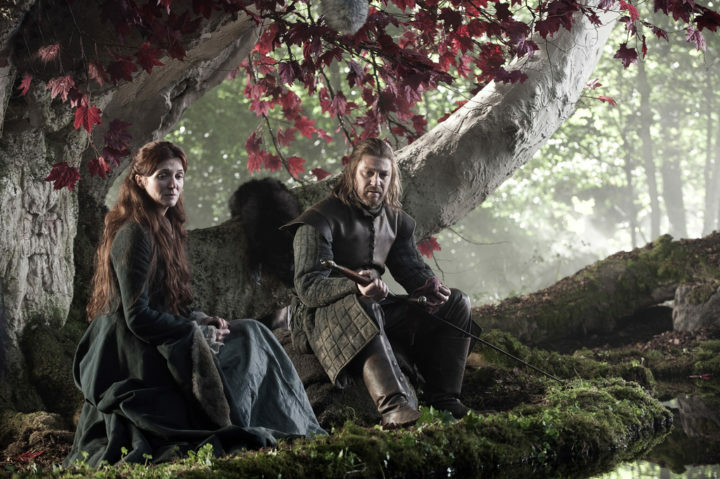 This photo of released by HBO shows Sean Bean, right, portraying Eddard Stark in the first season of "Game of Thrones." The final season of the popular series premieres on April 14. Westeros is a place that loves its alcohol, and correspondingly, there are lots of different adult beverages themed to the show. In Maine, Portland brewery Liquid Riot last year unveiled A Beer Has No Name, a double IPA themed to Arya’s mysterious mentor-turned-enemy, Jaqen H’ghar. New York brewery Ommegang has released beers themed to each season of the show; presently available are sour blend Queen of the Seven Kingdoms, smoked porter Mother of Dragons, imperial stout King in the North, barleywine Hand of the Queen and golden ale For The Throne. Check your local beer store for any of these brews. Not a beer person? California winemaker Bob Cabral has created a GoT-themed red blend and a Chardonnay that you can pretend is actually Dornish Red and Arbor Gold. And don’t underestimate the ability of HBO to slap “Game of Thrones” branding on anything and everything — there are Thrones-branded Oreos and Mountain Dew in supermarkets, there are five limited-edition Adidas sneakers themed to houses Stark, Targaryen and Lannister, and the Night’s Watch, and there’s an array of GoT-themed makeup palettes by cosmetics company Urban Decay. For a show with as immense a cultural resonance as “Game of Thrones,” there are surprisingly few public screenings of Sunday’s premiere. In fact, the only one we can find in Maine is at Smitty’s Cinemas, a chain of cinemas with restaurants in southern Maine, which will show each episode of the new season of “Game of Thrones” for free each Sunday; Smitty’s has locations in Biddeford, Sanford, Windham and Topsham. Chances are, you’ll be watching Sunday night’s season eight premiere from the comfort of your own home — perhaps after enjoying a meal themed to the show, featuring one of the amazing Westerosi recipes from the Inn at the Crossroads website. You, and millions of others, will take one last trip to the Seven Kingdoms. Valar Morghulis!